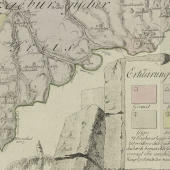 Maps helped geologists visualise patterns over large areas. Geology was a relatively new field of scientific study. A lack of standardisation resulted in varied visual techniques to represent and communicate meaning about the Earth’s structure. There were many approaches used to described how and why strata stack together. Some natural philosophers used chemistry and mineralogy to interpret the Earth’s formation and to imagine the processes that shaped geo-landscapes. Others relied on methods from natural history and antiquarian studies. 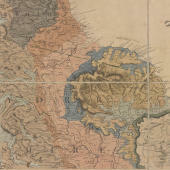 The maps displayed in Landscapes Below create a visual vocabulary for thinking through geological theory, presenting various arguments about how to reason and relate to landscape.